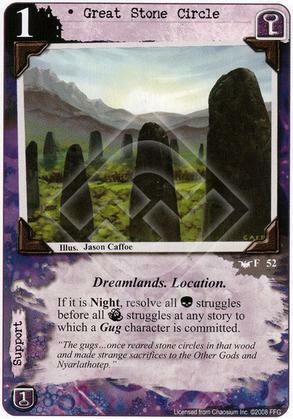 Flavor Text: The gugs... once reared stone circles in that wood and made strange sacrifices to the Other Gods and Nyarlathotep. Needs night and the effect is...OK. Overall a meh card. Well... I guess if you're super vulnerable to Terror struggles it might be worth thinking about including this card, but it both has to be Night and you need a Gug to commit. Too many conditionals for a so-so effect. Only used in one specific deck, a gug night deck. I'm sure it's an average card in that deck but otherwise unplayable.